I am so thankful for Walter and Cathy! They discovered my work at New Charlotte Church and looked me up at my Asheville studio. On August 6th they were ready to commission a painting of suitable elegance for the dining room of their new home — a painting that would be meaningful to them as they shared dinner with their guests. Especially important to Walter were the lyrics of his favorite Bob Bennett song called “Come and See,” and important to Cathy were the words from Psalm 34 : 8 — “Taste and See,” incorporating Hebrew text to reflect her Jewish heritage. Both Walter’s song and Cathy’s scripture included the important word SEE. Cathy sent me her dining room colors and fixtures and furniture. The dimensions were to be 48″ x 60″ to fit over her 80″ credenza which she described with designer detail, the base aluminum with a silver metal leaf finish and the top American white oak in an ivory ceruse finish. Colors would play a part in the choices I would make to create an artwork fitting for them, but the words that inspired them would be crucial for my interpretation and creation of this painting. They would reflect The Word. Come and see a Man from Heaven. Come and see the One that we Have heard of all our lives. Could it be We will see the face of God? And especially fitting for a dining room, the verse “Taste and See the goodness of the Lord; blessed is the man who takes refuge in him” (Psalm 34 : 8). This excited me because that is what my work is all about — The Incarnation which means to “take on flesh.” This man from heaven became a person to bring together heaven and earth. And He is the God who gives “eyes to see” who He is, a spiritual reality. When I told Walter and Cathy that I had three 24″ x 48″ canvas panels already available, they decided that a 72″ triptych would work even better with the central panel purposefully reserved for Christ, the God/man, inviting guests to celebrate the feast. The clients had both silver and gold accents in their room so this silver/gold triptych would work well. Although the process of applying gold leaf squares is tedious, I enjoyed the process and imperfection that happened when the feather-light leaf floated down to adhere to the rabbit skin glue and water (water gilding). It often missed the mark, but this allowed the ground color to peek through. These purposeful lines symbolize the “nets of God.” The grid they make undergirds this painting. I began by applying the dark oil paint and wax in a cross shape unifying the three panels. Dark is integral to the violence of the cross. I also needed the dark because I wanted to “pull out” the shape of the silver hands. The tool I use is a dough scraper. I can apply the oil and wax mixture with it, as well as remove while the paint is still wet. The size and flexibility of this tool allows for a suggested images and abstraction rather that a perfectly described image. By removing the top layer of wax and oil I exposed the leaf beneath it. This photo also shows the underlying grid lines or “nets of God’s sovereign love.” Here both hands have been formed revealing the silver beneath them. While the paint was wet, I removed it to write the Hebrew text, Taste and See at the top of the panels and the foundational word SEE at bottom center. I purposefully left the center gold. It would be the focal point — this man from heaven who opened heaven’s door and showed us the Father. But how to paint God’s glory — this God who lives in unapproachable light. I would have to leave the center golden if it had not been for the Incarnation! But Jesus became a man and entered into our darkness. He came as a sacrifice wearing a crown of thorns. (This photo was taken before I added the 23K gold leaf to symbolize the heavens open above Jesus’ head.) Under the figures is another small figure in the word SEE. If you look closely you will also “see” the words of the song Come and See. Jesus bent to love. The Hebrew word hesed describes this love. It means everlasting love that is humble, sacrificial, and bending. That is why I painted his crown of thorns prominently rather than his face. His name Yeshua, which is above all names, is written in the center of the thorns. This bending love allows us to take refuge beneath his everlasting arms. Blessed is the man who takes refuge in him. This silver hand (or is it two hands together?) is in motion. It is ethereal and holds a feather which symbolizes the Holy Spirit — also one of the persons of the Godhead. Yes, he bends down to die so we can live. He has opened wide the door of heaven (you will see The Heavens opened wide) depicted by the gold light above him. The crown of thorns, this offensive bloody crown, is now a glorious symbol of life. By dying and suffering, he has given everlasting life. That is the goodness of God. Taste Him and see His goodness — this God who is called the Bread of Life. We taste him by feasting on his Word. Jesus is called The Word of God. This is such rich food and gives life everlasting. He is wearing a white robe of righteousness and we are covered! Today we give thanksgiving for Jesus, the God who is one with the Father, who came from heaven to shows us the Father! And who gives us eyes to see him! Last year when I was about to begin a large commission called The Fisherman, I received an email from this sweet lady who had found my studio on the River Arts District website. She wrote, My father passed away a number of years ago and left from his tools of the trade – boxes of gold (as well as composition gold made from copper and zinc and aluminum and silver leaf as well as his daggers, burnishers, and brushes). My brother was going to throw them out but I took them thinking that they would be of use for someone. . . . I went on the internet and googled for artists in the Asheville area. Spotted a short description of the artwork you produce and with religious themes I felt this was the right avenue to pursue since my dad and grandfather did work in churches back in Ohio. What perfect timing! I already had a specified 60 x 76 inch surface constructed — three panels bolted together vertically — like an altar piece with The Fisherman on the central panel. The commission was to be abstract with The Fisherman overseeing the scene below — his fishermen drawing in their nets. The clients were familiar with my work since they had purchased a painting called One Who Came On The Waters of Time / The Fisherman and had also commissioned a piece for their wine cellar, Water into Wine/The Wedding Feast Miracle . But they needed a large painting for their Florida residence — a focal point of faith in their home. We talked extensively. I received relevant fabric swatches, which inspired me to order powdered mineral pigments like malachite, azurite, and chrysocolla to compliment their colors and the ocean near their Naples home. I researched water-gilding, the process of applying leaf which is so fragile and hammered so thin that the slightest air movement makes application difficult. The figure-ground would be painted with two different colors of bole, a clay based paint. I chose a blue for the aluminum leaf and deep red for the gold. These colors would show through the unevenly applied leaf to become part of the overall composition. As the red bole appeared through the tears and rips in the leaf, it reminded me of Christ’s sacrifice and the color of grace. Then the layering of paint and wax could begin! I covered both figure and ground with colors of the sea and began to develop the fishermen at the bottom of the painting. I allowed the gold and silver to become integral to the composition by scraping off the surface layers before they dried. I also inscribed lines that reminded me of my The Nets of God Series and the boat shape which was thematic in my Vessel Series. The large Fisherman held his nets in the heavens as the small fishermen drew nets into their vessel below. While the paint and wax were soft and pliable, I also made marks suggesting speech and Word of God. I incorporated automatic writing suggesting joy and song and later deliberate mark-making as in the Hebrew text השיחה (the call) under the face of The Fisherman inscribed when the paint and wax were drier. Capturing the mystery of the face of God was a challenge. Nothing sentimental or trite would do for The Fisherman, whose sovereign rule spoke the world into existence and who dwells in unfathomable mystery. The Hebrew text הדייג in his diadem reads The Fisherman. Some of these details are difficult to see from far or if the light is not reflecting on the gold leaf. This mystery adds to the glory and transcendence of the GOD and Creator of all things including faith! “For it is by grace you have been saved, through faith, and this is not your own doing; it is the gift of God” (Ephesians 2). The clients are happy that The Fisherman will be overseeing the gathering of many friends and guests who visit their home! The “gift of gold” was indeed a timely gift of grace. 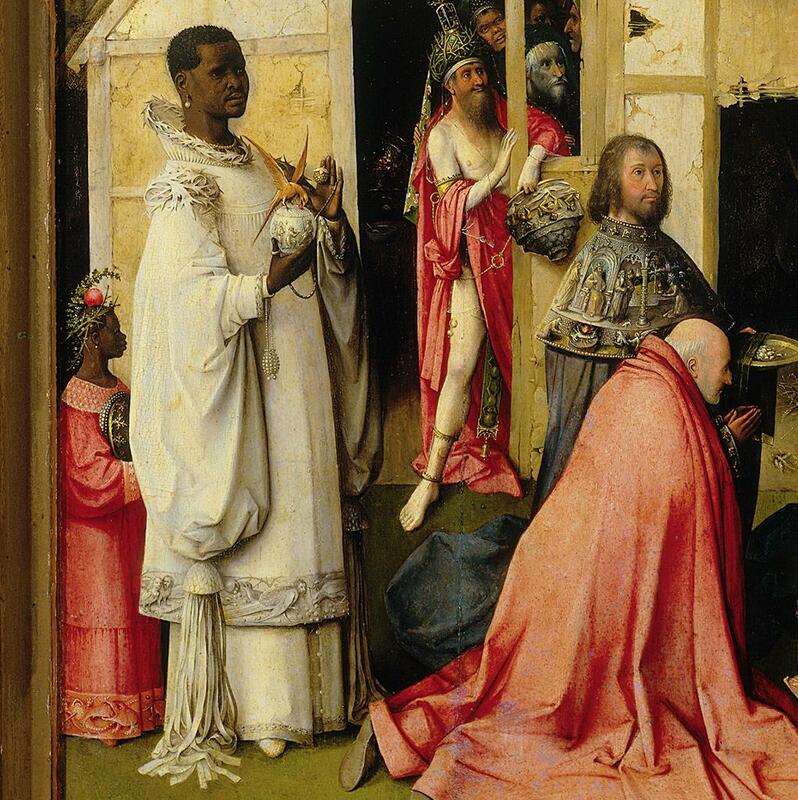 It has taken me all year to write about this first painting using my “gift of gold.” I hope to write about the rich metaphor and mystery in the commission that preceded this commission, The Wedding Feast / Jesus’ First Miracle. It will have to wait, as I am currently working on another miracle, The Miracle of the Five Loaves and Two Fish! In 2017, I also painted The Return of the Prodigal, and The Gardener, using gold leaf as the foundation. Happy New year — 2018 — from Soli Deo Gloria Studio. Anatomy commonly relates to the dissection of an animal or plant in order to study its structure. But it is also defined as an analysis or minute examination. This is an analysis of a painting that came to be titled “The Fishermen.” My only regret: I wish I had photographed the process more methodically! But perhaps the process (that miraculously came together as if I had orchestrated it) will help illuminate my painting process. “Art is work and the making of things is about process—a ‘truthful activity,’ Makoto Fujimura calls it–-that which unveils the veiled truths of what it means to be human, to plumb the depths of reality”(Catherine Page). My work is about this process of revealing true reality. It includes experience, art practices, education, intuition, and a “liberated imagination“–liberated by faith in the Creator God who holds all reality together and is the wellspring of truth and light. I had no pre-planned idea where this painting would take me. I had been reading Island of the World by Michael O’Brien and his poetry at the back of the book (“Beneath the Waves,” p. 822-825) was an important influence. A 4′ x 5′ gessoed panel was ready for the application of oils and cold wax medium. My main tool, a yellow-handled dough scraper, was lying ready on the table. I chose a warm Quinacridone Gold as the unifying base color (and a bit of red), hoping that fiery glory might show through later. Then I layered these warms with cool blues to begin a watery theme. The blues blended into the oranges while the paint was wet. I welcomed the subtle mixing of these compliments. I scumbled my scraper across the surface, allowing imperfections, scratch marks, and lines to add interest and texture. Scribbled words also enhanced the mystery and meaning in the layering process. This Hebrew word, abba, was hidden in subsequent layers. “To you, the one who came on the waters of time, like a swimmer, you passed in front of my eyes . . . . You were there a sudden presence, a form, a fire, slow silent fire . . .” (Michael O’Brien). But “the swimmer” was hidden in the subsequent layers of blues and became “the form, finely wrought, fire upon the water” (ibid). Then I waited several weeks before returning to this painting. It was too monochromatic and lacked a strong focal point. Courageously I attacked it with red. Perhaps I was seeking Incarnation and “the one who came by water and blood — Jesus Christ; not by water only but by the water and the blood”(1 John 5:6). I allowed a figurative shape to appear in the negative shapes and added warm oranges and a lurid yellow around it. This layering would build the “history” of the piece, allowing glimpses of red and yellow to show through later. I also sprayed these warm colors with mineral spirits. They ran down the center of the painting to break up the space on the lower half. I applied gold leaf above this figurative shape to suggest glory. I was thinking of the One who walks on water, but unfortunately controlling the miraculous is not possible. Instead of mystery my painting felt contrived. To unify it, I had to forgo any predetermined outcome. I had to release it and approach it as design. Then, perhaps a miracle could happen. The colors were not right, so I added glazes of red and greens and covered the distracting (and contrived) gold leaf. A large painting is more difficult partly because it is challenging to mix the correct amount of color needed for a large area. I mixed bolder colors — a huge amount of the complimentary color — a dark purple. I covered the intrusive figures (now there were two “water-walkers”) and courageously lost the entire top half of the painting, using rollers. It was an ominous dark, but I left a bit of white to the left side and scraped away an arch shape. I do not recall how the two figures emerged from the grey blue that I layered over the purple. But to break up this dark expanse I loaded my brush with mineral spirits and began making automatic marks, the music of the spheres or perhaps God singing His Creation into being. Then I immediately subtracted the dissolved color with a sponge roller to reveal the very first blue layers underneath. The miracle was beginning to happen! In releasing or “giving up control, “mystery and beauty began to emerge. The random large “speech marks” became God’s voice on the surface of the deep as He spoke creation into existence. Finally, I worked the central figurative focal point by incising the painted layers down to the first layers of paint. The Nets of God “emerged” next to the figures referencing my Nets of God Series. I removed some of the paint around the two figures, but the tiny cross between them was unplanned! The crux of history showed itself miraculously. It subtly joined the two figures — God the Father and God the Son (The Fishermen), who were coming to gather the elect from every nation. They were standing at the gates of heaven. I am always amazed how the wrestling and work that is painting is a miracle — a miracle given to us as creators by The Creator which allows us to reveal the God who created the visible and invisible world. Painting is indeed a process of working and waiting on God to direct my heart, soul, mind, as well as my hand. “For in Him we live and move and have our being, as even some of your own poets have said, ‘For we also are his children.’” Paul is explaining the divine to the Athenians at the Areopagus in Acts 17. Life is sacramental. We are created in the image of God to give him glory. Epiphany is a Christian festival observed on January 6th. It commemorates the manifestation of Christ to the Gentiles in the persons of the Magi or Wise men; the Twelfth-day of the Christmas celebration which ends the last of the five weeks or forty days of Advent (December 29-January 6). After forty days of awaiting the birth of “Emmanuel” (God with us) at Bethlehem, we celebrate the climax of Advent, Epiphany, when Jesus Christ is recognized as King by the wise men of the world. Christ Jesus is shown forth not just to the Jewish people but to the Gentile world. Yes, the 40 days of Advent are over. The King of Kings is here! Wise men still seek him. And we wait during our “40 years of tribulation” for the final Epiphany when every eye will see him, and every knee will bow and confess that Jesus Christ is King. The Magi were members of the religious hierarchy of ancient Persia and Media (the region corresponding to modern Iran). They were scholars and practitioners of astrology and the first Gentiles, men of renown, to come and worship Jesus, the King (Matthew 2:1-12). Hieronymus Bosch painted an account of this historical event in 1495 (detail left — now in Madrid’s Prado). 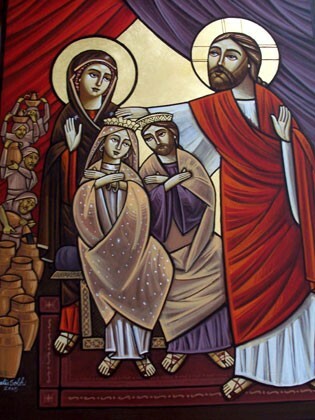 To “show forth” Jesus to the world, Epiphany also celebrates The Baptism of Jesus and The Wedding Feast at Cana as depicted in these two modern day icons. 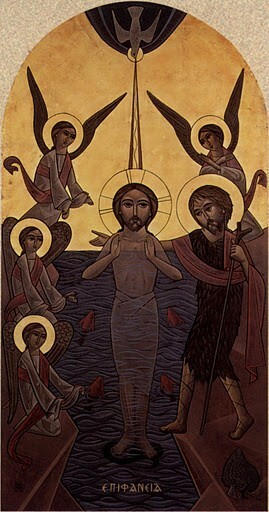 The Baptism of Jesus in the Jordan River is seen as Jesus’ manifestation to the world as the Son of God. The Wedding Feast at Cana shows forth his divinity as he performs his first miracle. This wedding was performed in a Gentile town in Galilee, not Judea. It is a fitting anticipation of Jesus’ own Wedding Feast in eternity celebrating with all nations tribes and tongues the Wedding Feast of the Lamb! It was a revelation of “awe and wonder” when the wine Jesus made from water was first tasted. This amazing wine was and is a picture or foretaste of the awe and wonder of heaven itself and the celebration of The Wedding Feast of the Lamb in eternity. In the lower part of the painting are the six water jars for Jewish purification. The wedding celebration is happening! The central jar is the crucible of the cross, “the still point where the dance is” (T.S. Eliot), and the miracle truly happens. Jesus, the God-man, mediates between heaven and earth and out of his pierced side blood and water flow. This crux of the first miracle is Jesus’ own blood sacrificed for sin that makes celebration in heaven possible. You may be able to see his thorn-crowned head in the red central stem of a chalice connecting heaven and earth. Christ is looking down on his mother Mary’s face in the base of the chalice. At the top of the chalice (the top of the painting) is the figure of the Bride dressed in embroidered garments meeting her Lover, and on the left side The Lamb of God stands on a golden throne. The chalice suggests Holy Communion, one of the sacraments that Jesus instituted for his “Bride” while she awaits full and perfect communion in heaven. Blues, reds, and golds symbolize the colors of water, blood, and Spirit — the three that bear witness to this first miracle that “shows forth” who Jesus is, the God who came to redeem a people (his Bride) for himself, the God who celebrates and loves his bride in the splendor of holiness and beauty. The joy and anticipation of eating and drinking with Jesus Christ at his table with all nations tribes and tongues is part of the celebration of Epiphany. This manifestation of Christ to the Gentiles and the revealing of His divinity are critical in the history of Redemption. Advent has ended and we await the Second Advent with anticipation! I will miss the artists at The Pink Dog Creative, owners Hedy Fisher and Randy Shull, and the space there that David Holt shared so graciously with me since January 2016. Glass Sky Enterprises purchased my former studio at 140 Roberts Street Studio, so I have been thankful for this interim at Pink Dog. David is leaving at the end of August as well. He is being inducted into the North Carolina Music Hall of Fame in October, so has been very busy with little time to paint. I do own this small piece of history though! Wish you continued success David! January 1 moving in; quite a downsize from 140 D! By August (below), I was crowding David out! Fortunately, I found a large space on the second floor #6 of The Warehouse Studios, just across the railroad tracks. (right or wrong side of the tracks?) It is a huge luxury with library space, wifi, and my sixty-dollar sofa for napping and artists’ gatherings! Can’t wait to get it organized! So far, no messy tarps or paint cover the floor, but a gessoed triptych panel (60 x 76) awaits! My next post — The Anatomy of a Painting — is about my work process and why a commission is difficult, because the left brain has a tendency to analyze and follow consigned plans. It gets in the way of the right brain and the spontaneity of the spirit. I hope to document it along the way! Painting is work and wrestling. The making of things is about process — the process of unveiling veiled truths / revealing true reality, discovering what makes us human. This takes both sides of the brain and the help of the Creator God and Holy Spirit. My work process includes my experience, my intuition, my education, my art practices, and my faith in a God who holds all reality together and is truth and light. I am looking forward to getting to work! The wall to the left is a gallery wall and paintings lined up are waiting to be hung.